“We were already, already bored/Sometimes I can’t believe it/I’m moving past the feeling”, sings Win Butler on “The Suburbs”. With its simple pianos and otherwise stripped-down sound, the opening track from Arcade Fire’s third album immediately announces the Montreal band’s attempts at (and, perhaps, anxieties over) departing from the baroque bombast that has become its hallmark. 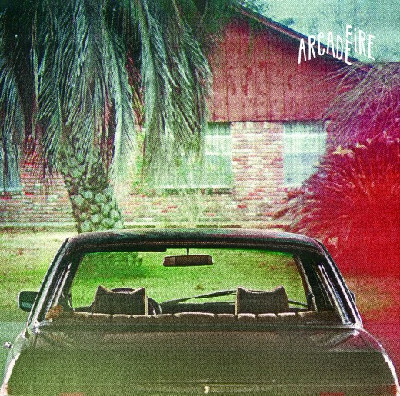 Given the name of the album, much focus has centered on how Arcade Fire might be moving from the political provocations of Neon Bible to critiquing the impact and ennui of residential sprawl in modern society. And while that theme appears throughout the album, just as salient is the corresponding unease with passing time and the inevitability of change as Butler croons that “the clock keeps ticking” over unadorned guitars on “Modern Man”. Yet, The Suburbs’ standout tracks are those that indeed dwell in the past, reminding the listener of the grand theatrics of Funeral and Neon Bible, such as “We Used to Wait” and “Suburban War”, which features the lyrics: “You said the past won’t rest/Until we jump the fence and leave it behind”.